Vancouver, B.C. 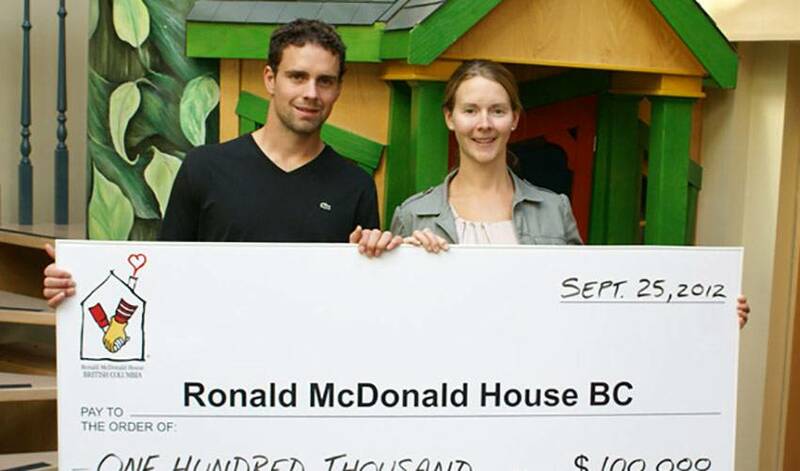 – Ronald McDonald House BC announced today that Dan and Sarah Hamhuis have generously donated $100,000 to help build their new House. At 74,000 square feet, the new 73-room House will be the second largest Ronald McDonald House in Canada. Located on the campus of BC Children’s Hospital, the House will ensure that families are always close to their children and the life-saving treatment they need. "British Columbians have a long and rich tradition of supporting BC’s sick children and their families,” says Richard Pass, CEO of Ronald McDonald House BC. The new House is such a significant expansion of Ronald McDonald House BC’s capacity to serve, that it will no doubt inspire our donors to get involved and help us open our doors on time in January 2014. Dan and Sarah Hamhuis have been a great encouragement and support to our families at Ronald McDonald House BC, and we are so thankful for their generous donation to our New House. While playing hockey in Nashville, Sarah and I started working with RMH and really enjoyed meeting and supporting the families that came through. When we moved to Vancouver it was a natural fit for us to stay involved working with RMH, said Dan Hamhuis, a B.C. native and NHL player.Growing up in northern communities in B.C., my wife and I have seen first-hand the help Ronald McDonald House BC has provided to friends of ours. We are excited to contribute to a new RMH that will serve many more families for years to come." The new Ronald McDonald House BC is made possible by the It’s Time Campaign, a multi-year fundraising effort. Launched with a matching grant from the BC Government in 2011, and led by RMH BC Board member Gary Segal, the campaign is inviting donations from individuals, foundations, and businesses in order to raise the remaining $4.5 million of the $28.8 million total project cost. While my family fortunately, has not needed the use of this vital service, I know how much it truly means to those that do,” says Segal, also a noted philanthropist. “Contributions to this crucial expansion will have a lasting impact on the lives of BC’s sick children and their families for generations to come. Construction of the new Ronald McDonald House BC will begin this Fall, with completion slated for January of 2014. Established in 1983, Ronald McDonald House® BC & Yukon is a vital resource to the residents of BC, Yukon and Western Canada. RMH BC is a home-away-from-home for children requiring medical treatment at BC Children’s Hospital, and for their families. Ronald McDonald House eases the emotional and financial strain of being away from home and allows families to fully concentrate on giving love and support to their children. To support the new Ronald McDonald House BC project, visit www.rmhbc.ca.